I'd be careful making the economic argument without accounting for the total costs of the respective technologies. It is often claimed that nuclear is just too expensive and this may be true but not without being shown via full disclosure. That is, the fuel, operating, waste management, insurance, subsidies etc. costs should be included. Fuel costs can fluctuate for nuclear plants, operating costs can be substantial, long term waste management can be astronomical, insurance premiums are high, and the industry as a whole continues to be subsidized by taxpayers despite being mature and profitable. All of these boxes should be evaluated for nuclear alternatives, including fossil fuels, which are also mature and profitable as well as subsidized. The fact of the matter is that we do not know what the true costs of these things are because there's a special kind of math that gets done in order to obfuscate them and maintain the status quo rather than charting a course built upon attaining true sustainability. Indeed, Vermont Yankee closed because it was unable to compete with, among other things wind and natural gas, but it is also a very old, small, single unit plant. Similarly, Kewaunee in WI has also been shuttled for the same reason and Oyster Creek in NJ will be soon as well. Alternatives have a very compelling argument when it comes to their lack of fuel and waste management costs as well as their inherent environmental benefits. And there's also no reason to approach the argument as an either or one. We currently get about 10% of our energy from nuclear, about the same as we get from hydro and renewables combined. We get about 40% from coal and its a far more devastating practice than any of the others, e.g., mining decimates local habitats and the enormous amounts of waste product, including radioactive effluents present serious health and environmental concerns that go unchecked. There is no panacea, including nuclear, but if there is an argument to be made, an economic one is the right one to make but it must be done with full disclosure and some weighting for environmental benefit and sustainability. And keep in mind that the waste managements fees for nuclear are not currently included in the prices. Once the spent fuel and waste leaves the reactor, it goes from being a ratepayer's problem to a taxpayer's problem and there is currently no alternative to Yucca Mtn to store the stuff other than on surface lots at the plants, which isn't a very well thought plan either. The waste needs to be addressed. "The fact of the matter is that we do not know what the true costs of these things are because there's a special kind of math that gets done in order to obfuscate them ... "
That high upfront cost is what keeps investors at bay. This is the part of the cost argument that nuclear energy deniers concentrate on. However, the cost is so high for solar that even with subsidies that approach half of the total cost, few people are willing to spend tens of thousands. Both sides of the argument easily show their preferred source of energy will be more cost effective in the future by simply picking favorable assumptions about operating costs and prices. But nobody can predict the future. On the other hand, nuclear is the only source with a half-century long proven track record of providing competitively priced power. "That is, the fuel ..costs should be included ...Fuel costs can fluctuate for nuclear plants..."
This is even more true for wind and solar. When the wind dies or the sun does not shine, natural gas power plants turn on and begin consuming fossil fuels. Wind and solar are components of a natural gas hybrid power system. The cost of operating that hybrid system goes up along with the price of natural gas. It is simply untrue that wind and solar do not require the burning of fossil fuels to be viable. "...operating costs can be substantial..."
Wind turbines last roughly half as long as a nuclear power plant. It can cost up to $10,000 to replace the inverter for a home solar panel system. In fact, home owners are typically warned to expect to replace it at some point, like a gas furnace or dish washer. I think you are making some presumptuous claims. The fact is that fossil fuel and nuclear projects entail an enormous amount of fuel and waste whereas wind and solar require only that which is necessary to produce the generators. The nuclear waste confidence ruling, for instance, demonstrates the lack of stability and clarity on the nuclear waste issue as well as the costs. Costs estimates are also not as clear as some claim. 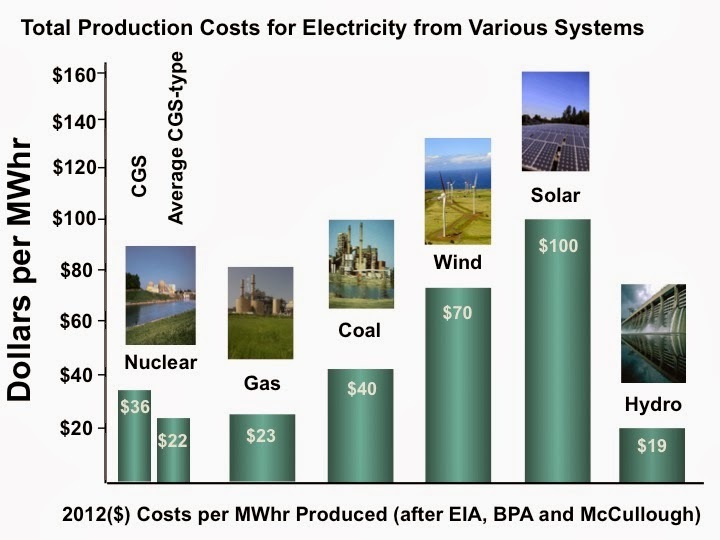 More often than not, the costs cited for nuclear are extrapolated from plants either built over 30 years ago or built elsewhere and then pegged against state of the art wind and solar projects and in all cases fail to subtract how much of these costs are represented by litigation alone. It is simply not an honest discussion if we continue to cherry pick circumstances and numbers. For instance, comparing decrepit nuclear plants vs. state of the art solar and wind or residential/small scale solar and wind to massive baseload nuclear and coal. And keep in mind that wind and solar, when paired with a storage or backup system, do compete with other forms, albeit at a higher cost. Suffice it to say that this debate has been completely distorted and confused by the various biases and special interests involved. There is no panacea, including nuclear or solar and wind but taken as a whole, we have enough resources and technological know-how to develop more sustainable energy policies and that is what the focus should be, not picking winners and losers. "I think you are making some presumptuous claims"
And I think you are making some presumptuous claims. Comments like that area waste of time, energy and space. "The fact is that fossil fuel and nuclear projects entail an enormous amount of fuel and waste whereas wind and solar require only that which is necessary to produce the generators." Your argument was made moot by a recent study by the NREL which demonstrated that renewables can't do it all. We need renewables and nuclear. Words like "enormous" have no precise meaning. When put into perspective, all of the waste generated by nuclear energy production in last half century would fill a football stadium a few feet deep. The fact that it is being stored in their own parking lots because anti-nuclear ideologues have stifled efforts for a government repository is all the evidence needed for how little waste it produces. A piece of nuclear fuel the size of an ashtray provides enough power for an average American for a lifetime. "The nuclear waste confidence ruling, for instance, demonstrates the lack of stability and clarity on the nuclear waste issue as well as the costs." We can all thank the anti-nuclear ideologues for the fact that we still don't have a National waste repository. "Costs estimates are also not as clear as some claim." That is as true for renewable energy enthusiasts as it is for other enthusiasts. "More often than not, the costs cited for nuclear are extrapolated from plants either built over 30 years ago or built elsewhere and then pegged against state of the art wind and solar projects and in all cases fail to subtract how much of these costs are represented by litigation alone." None of that statement is correct. "It is simply not an honest discussion if we continue to cherry pick circumstances and numbers. For instance, comparing decrepit nuclear plants vs. state of the art solar and wind or residential/small scale solar and wind to massive baseload nuclear and coal." "And keep in mind that wind and solar, when paired with a storage or backup system, do compete with other forms, albeit at a higher cost." "Suffice it to say that this debate has been completely distorted and confused by the various biases and special interests involved." This is true, and goes without saying, however, reality is there if you look for it.